The only things getting assaulted were baseballs, and the only things stolen was bases. OK, assume this is correct. How does this effect the "shootings happen in gun free zones?" Conversely, it has been said that Jared Loughner openly carried his weapon for at least 15 minutes prior to when he went on his rampage in the parking lot in Tucson. Why should people be forced to decide who is a "good guy with a gun" and who is a potential threat? How many shooting were there before they were gun free zones? That even increases the validity of what Laci says. The idea that gun free zones are a magnet to mass shooters is nonsense. So is the idea that posting gun free zone signs will prevent criminals from taking them there. Yep, MikeB, that's why there are no school shootings. "So is the idea that posting gun free zone signs will prevent criminals from taking them there." That's a straw man. I never said that. What I say is the gun free zone is not a magnet for criminal shooters. I know you say that Mike, that mass shooters don't base their decisions based on gun free status. I even mostly agree with you on it. 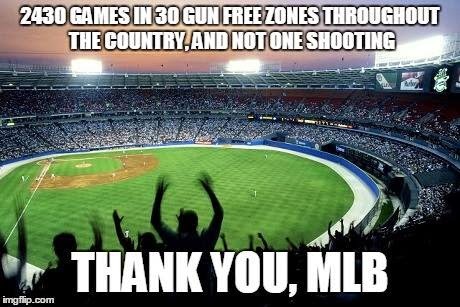 Laci's premise of course seems to suggest that the gun free status of MLB games has resulted in no shootings at all there. I didn't get that. I thought Laci was saying exactly what I say by poking fun at the folks on you side of the aisle who continually claim that criminal shooters are attracted to gun free zones. I know you "mostly agree" with me on this one. What I don't get is why your agreement is not unequivocal. There seems to be a surprising lack of gunfire at most sporting events, whatever the venue or time period. Of course, for sheer numbers of lawless events, it would be hard to beat sporting events in Europe, soccer, rugby, and even cricket gets mentioned. For the most serious act, I'd have to go with the stabbing of Monica Seles by a Steffi Graf fan in Germany in '93.